So I’m a little freaked out. Technically, there is ten days left until Halloween, BUT we are going to the Zoo Spooktacular this week! Sounds like fun, right? It is! We have a blast every year and to some degree, I can’t wait. Ah, like I don’t have enough on my plate. With all this running around trying to get him a costume, I realized that we don’t have costumes yet! We were planning on getting dressed up in a family costume but this little one is being bratty! Not to mention that October is a midterms time for me. I’m kind of happy that my exams got split up through three weeks. I got lucky with this one. I can focus on each exam, one at a time. You would think that I can enjoy this little break but what do you know? We get sick! I’ve been feeling yucky for two weeks now and little man spent last week at home, sick. He went back to school today and I get a little quiet time. He is so active and when he was sick, it was a lot of peace and snuggles. Once he started getting better, he was like a humming bird in a shoe box. He was going crazy from being at home for so long a he was determined to take me down on the way! It might be Monday morning but I’m enjoying a few minutes of quiet. 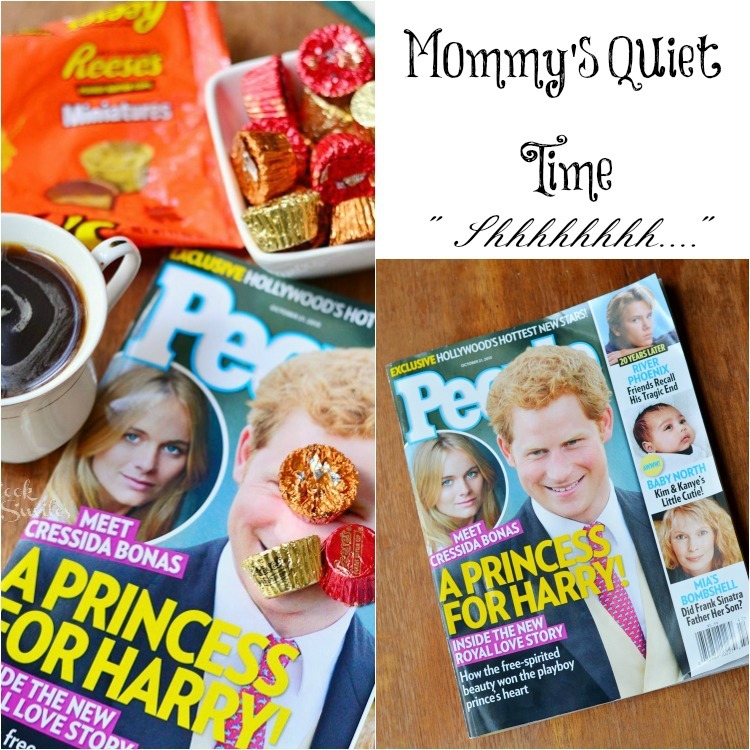 I got my coffee, my Hershey’s Dish CANDY and my PEOPLE Magazine! Did I mention the cookie bars?!!! 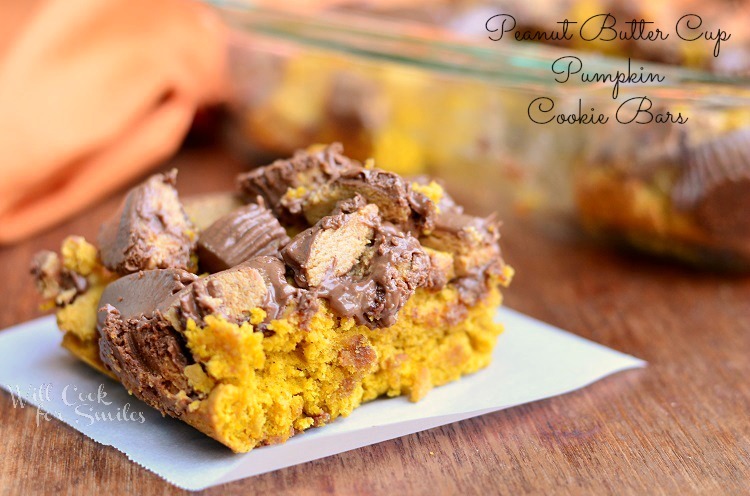 These Peanut Butter Cup Pumpkin cookie bars are SO delicious! 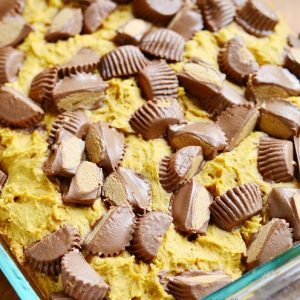 It’s soft and fluffy pumpkin cookie bars topped with everyone’s favorite Reese’s mini peanut butter cups! 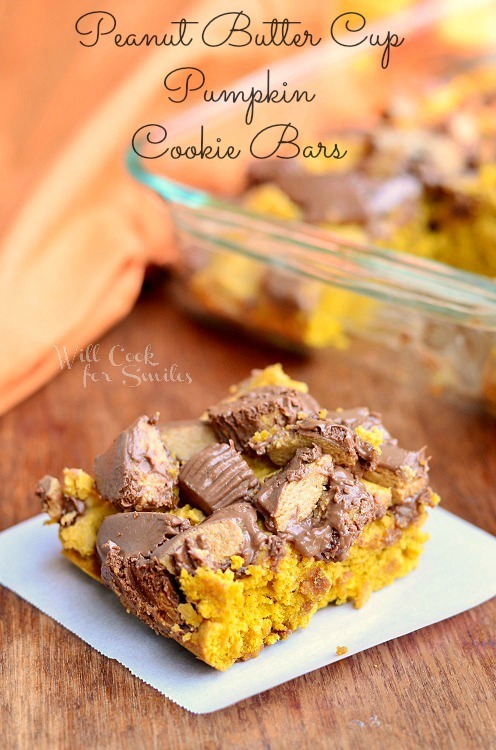 These cookie bars are so easy to make too! I use an old-fashioned pumpkin cookie recipe from Libby, right off my pumpkin puree can. Pumpkin cookies are wonderful and we already established that pumpkin is great flavor combination with chocolate and caramel. 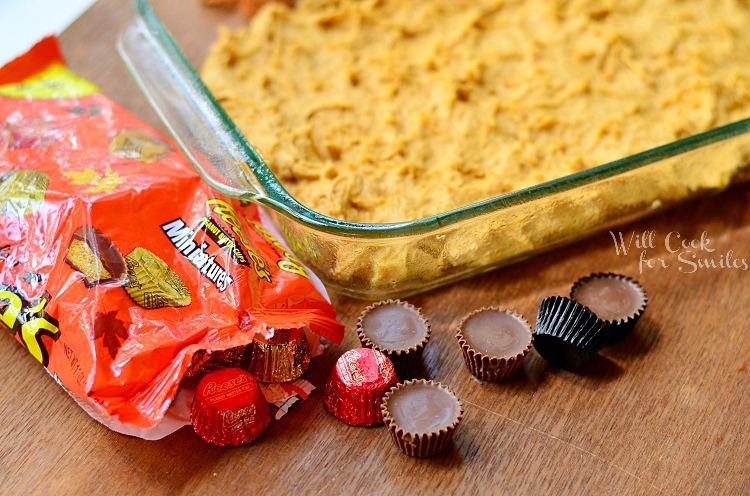 Now, I KNOW what pumpkin and peanut butter cups are amazing together! 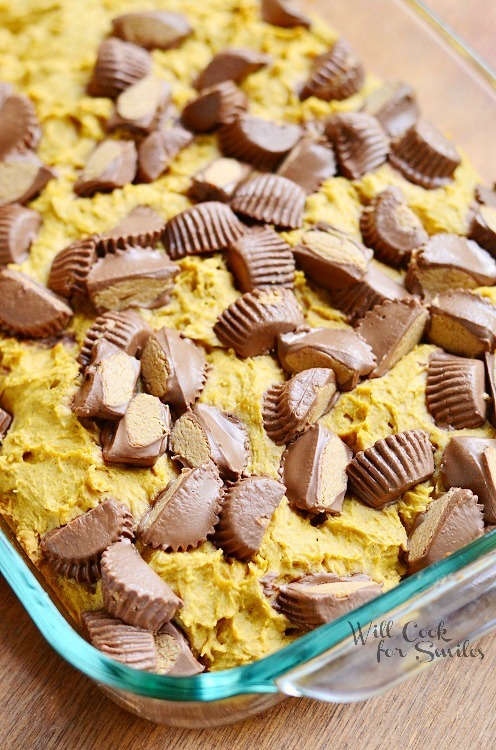 Made with peanut butter cups and pumpkin this dessert is amazing. Preheat the oven to 350 and grease a 9x13 baking pan. 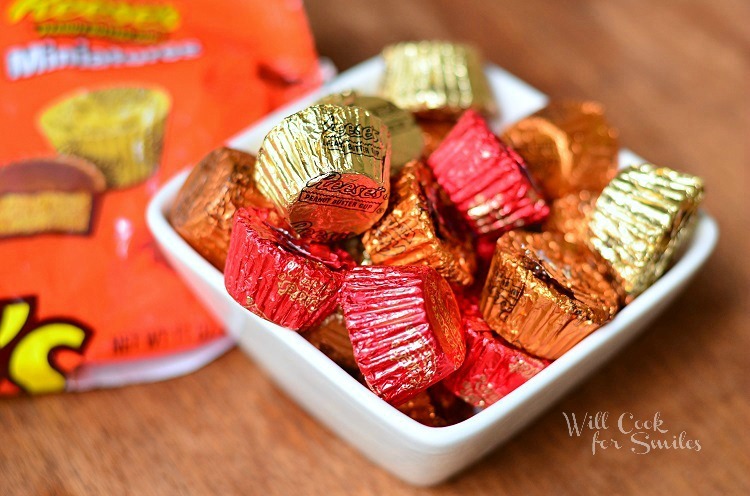 Unwrap the Reese's mini cups and cut them in half. In a bowl on an electric mixer, beat butter and sugar until light and smooth. Add pumpkin and vanilla extract. Mix well. Sift in the flour, baking powder, baking soda, cinnamon, nutmeg, allspice and salt. Beat on low until just combined. Spread the cookie batter over the the baking pan, evenly. 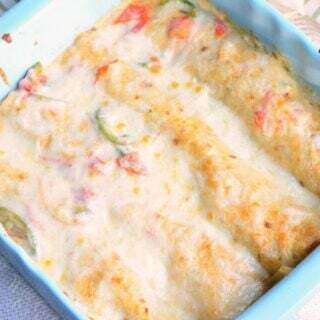 Bake fore 10 minutes. Well, I am off to have some quiet ME time before I have to prepare for an exam! You can pick up all the ingredients, Hershey’s Dish candy and PEOPLE magazines at your local Target! I have a coupon for you too! 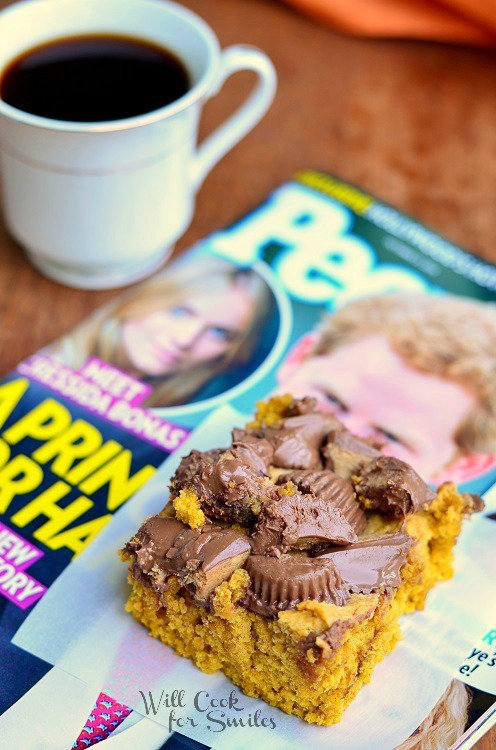 While supplies last, you can CLICK HERE to print a PEOPLE Magazine and Hershey’s Dish Candy $2 Off Coupon! You poor thing — getting sick, exams, and Halloween costume problems. My oldest son always gave me problems on Halloween — he was the only kid that wouldn’t wear a costume till he got to be about 4 years old. He completely best to his own drum! These bars look incredible! 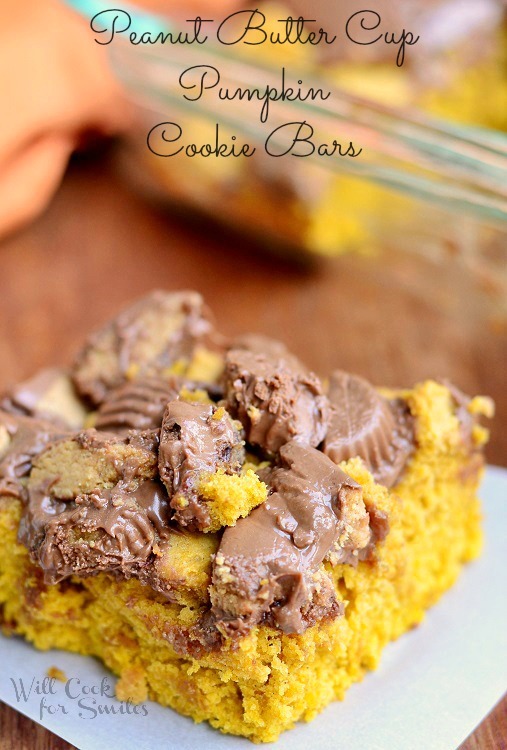 I love the combination of Reese’s with gooey pumpkin cookie bars! I think you just described my son!! Hang in there and eat more of these delicious looking bars! Holy moly they look fantastic! These cookies bars look so amazing! 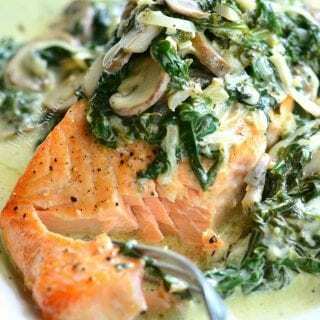 I could eat the whole pan Lyuba! These cookies sound great. 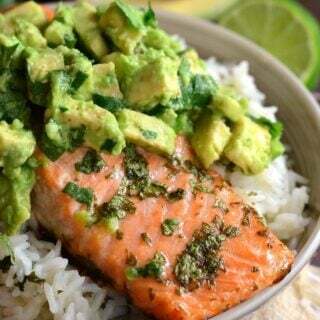 I love that flavor combo. Hopefully, you’ll find the perfect Halloween costume soon. We all have days like this. Hang in there. Enjoy your Pumpkin Cookies. 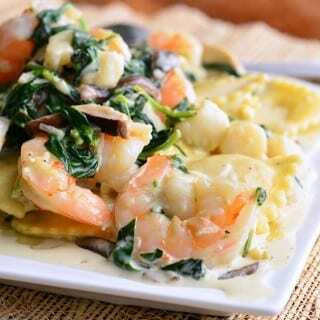 They do look like a really good comfort food. Wow these sound great, that would be perfect during my tiny little piece of quiet time I get in the afternoon. Thanks for sharing! I would just like to announce that I have made these and they are AMAZING!!!! 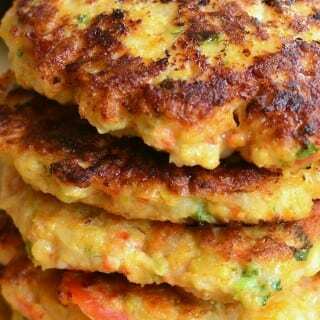 Go make them now! 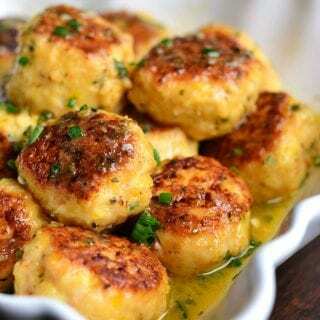 One of my new favorite pumpkin recipes. Thanks for sharing! Yay! I’m so happy you liked it! This type of comment warms my heart!